During my first year in California, the only get-togethers I had been to were either at a restaurant or someone’s house for a “BBQ” (in Californian tongue, that translates to store bought machine packed hamburgers, hot dogs, and sides). Growing up in Texas, all my family and friend’s parties included some good grub; 12+ hours of smoked meat (usually brisket), pounds of fresh fried catfish caught down the river, or at least fresh fajitas with homemade salsa and sides. For my birthday party that year, I wanted to introduce part of my Texas upbringing to my Californian friends. I will be the first to agree that the food isn’t more important than good company, however, it is difficult to beat fresh and wholesome made from scratch family-style meals. Despite late June being already brutally hot in Texas, it marks the end of the May-Gray and June-Gloom California winter doldrums. Fortunately for me, crawfish season runs from March through June. When I started to invite people to my party, no-one knew what a crawfish was, let alone had ever eaten a crawfish before. Reactions ranged from bewilderment as I tried to describe them as “little lobsters”, to excitement when I assured everyone that a proper boil includes plenty of beer. 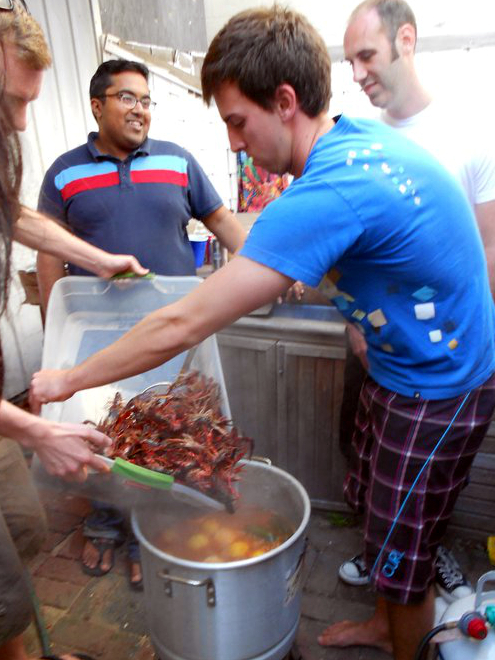 Planning my first crawfish boil in California posed significant hurdles. It took me almost 2 months to find a suitable burner and large enough pot, and it was nearly impossible to find live crawfish in LA! Funny how things are so different just three states over. If you walk into an Academy (sporting goods store) in TX, there is literally a whole aisle filled with crawfish and turkey fry burners and pots. In college, we would head over to the local HEB (grocery store) and pick up as many crawfish as you could fit in the back of a pickup truck at $1.99 a pound. A week before the party, I finally found the only propane burner in LA and had to settle for an “overnight” crawfish delivery from a place in Louisiana. Not trusting they could actually overnight 60lbs of live crawfish, I ordered it to be delivered Friday. To my amazement, it arrived 9am Friday morning as promised. I lost about 15 lbs. that year trying to keep them alive for the party Saturday – lesson learned. As it turns out that was fine because we didn’t even get through the remaining 45lbs; many of my new California friends couldn’t handle the spiciness (I thought I had made it pretty mild), nor had they perfected the proper way to eat a crawfish. 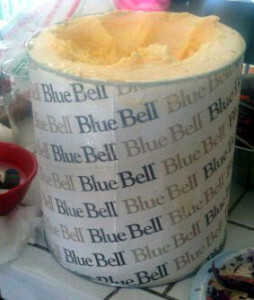 In comparison, an average Texan would eat at least 2-3 lbs. with many of my friends binging on 5lbs + by the end of the day. The now annual event has turned into a great way to stay in touch with several folks that I only get to see once or twice a year and meet several new friends as friends of friends are always welcome. Over the years, I have had the pleasure of hosting several visiting or expat Texans at the boil. They never let me down and always pull their weight in number of crawfish and beers consumed. The past couple of the years Amanda has surprised me with 3 gallons of Blue Bell for dessert (the best ice cream in the world – although I will be taking nominations for second place this year), which she had to bribe the only restaurant in town that imports it, since it’s not sold to the public in CA. Jump forward to 2013 and the 5th Annual Southbay Crawfish boil, I am proud of the California adoption of eating crawfish. 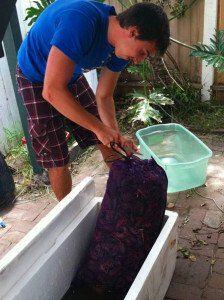 Everyone easily slurped down 80lbs as fast I could cook them, begging for more spice (I used 22 lbs. of extra spicy Cajun seasoning). Although I doubt I will get to plan one for my bday next year (unless I can somehow get crawfish delivered to Eastern Europe), I hope to continue bringing people together from different walks of life around home prepared meals.